If you want to see how I rated each book click on the Goodreads book shelf on the right. The Domino Pattern is the fourth book in the Quadrail Series. Think Murder on the Orient Express meets aliens group mind ( the Modhran) that wants to take over the galaxy, add a host of other aliens, a detective partnership made of up a human and a half human, and you have the books in the this series. There is always the risk that a series will get stale after a few books. That is not the case with the Quadrail Series. This time Frank and Bayta are on a non-stop super express line that cuts the travel time across the galaxy from months to 6 weeks. Events conspire to make the Modhran, Frank and Bayta allies after someone manages to get poison past the spiders detection system. Frank and Bayta must find and stop the person using the poison. People trust the safety of the Quadrail system and that trust must be maintained or the whole system could break down and the galaxy thrown into turmoil. It is up to Frank and Bayta to find and stop the person using the poison while preventing any future threat to the Quadrail. The Domino Pattern introduces a brand new villain, one that will move the series in a new and exciting direction. Maybe the Modhran will become partners instead of enemies. I am looking forward to the next book in the series. 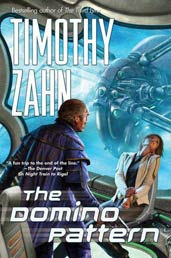 TOR published The Domino Pattern by Timothy Zahn in 2009. I checked The Domino Pattern out from the Rogers Public Library. The last book in a great series always brings on mixed emotions. There is joy in finally finding out how everything ends and sadness because there will be no more books to look forward to. The Lost Fleet: Victorious generated an abundance of both emotions. When we first met Captain John “Black Jack” Geary his escape pod was picked up after drifting 100 years. Geary and his ship were the first causalities of a war that has lasted 100 years and legend says that when the time is right he will return to save the Alliance. The fleet has just suffered a crushing defeat at the Syndic home world, all senior officers are dead and Geary as the Captain with the most seniority is in command. It is his job to try to get the remainder of the fleet home. In Victorious the cycle closes. After bringing the fleet home Geary is promoted to Admiral of the Fleet. His job is to return with the fleet to the Syndic home world, end the war and find the aliens on the far side of Syndic space, He must do this while allowing enough himself enough maneuvering room to find a solution to his own personal goals. Like the rest of the series, Victorious is military science fiction at its best. The action is realistic and gripping. Victorious is filled with interesting characters, a well-written plot and a recurring theme of honor above all else. Victorious is a great ending to a great series. Do start this series at the beginning. Just make sure you don’t have anything pressing because you will not want to put any of the books down. 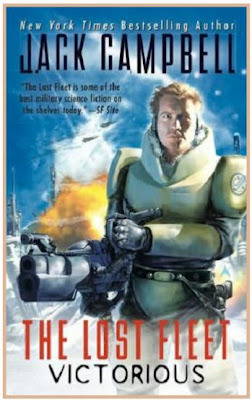 Ace published The Lost Fleet: Victorious by Jack Campbell in 2010. I purchased Victorious from Borders. In Dopplegangster, Esther Diamond and friends are at it again. Her Off –Broadway show has closed and she is back working as a singing waitress at a restaurant where members of the mob hang out. Detective Lopez, her want to be boy friend, is afraid something bad will happen to her there and wants her to find another job. He is proven right when Charlie Chiccante is murdered right after telling Ester that he has just seen his doppio. A doppio is a perfect duplicate of a person and a sign of immediate death. When other doppelgangers start to show up Esther goes to her old friend Max for help and the fun begins. Like Disappearing Nightly, the first book in the series, Dopplegangster is filled with humor, mystery, suspense and a great cast of characters. I hope to see more of Esther and friends in the future. Daw published Dopplegangster by Laura Resnick in 2010. 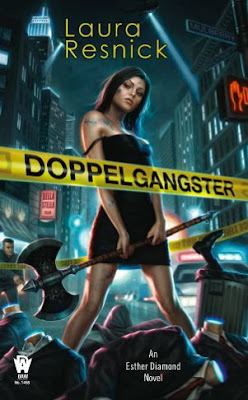 I purchased Dopplegangster by Laura Resnick from Fictionwise. If you leave your email in a comment I can send you a coupon for 10% off from Fictionwise. What Angels Fear starts off looking like a typical Regency Romance but quickly becomes a mystery. The manners and society of the era are worked into the lives of the characters. What Angels Fear is the first book in a five book series. I loved the main character, Sebastian St Cyr, Viscount Devlin. When he finds himself accused of murder he calls on skills he used in the Napoleonic Wars. Knowing he will be convicted unless he finds the evidence to clear himself, he disappears into the London underworld. Using a group of friends and allies he works to uncover the truth. The fact that I like to read Regency Romances increased my enjoyment of What Angels Fear. This was a different outlook on a world I had already visited many times. I am looking forward to reading the other books in the series. (More books for my TBR pile). Penguin published What Angels Fear by C.S. Harris in 2006. C.S. Harris writes historical romances as Candice Proctor. I purchased What Angels Fear from Amazon. According to something I read Star Crossed is Susan Kirnard’s first published book. It is also her only Science Fiction Romance. Like many authors she is writing where the sales are and now writes paranormal romances. I am mentioning it here only because it is always interesting to see how author’s styles have changed as they gain more experience. Star Crossed has a good story concept and if you like Science Fiction Romance look the book up. As the title suggests the two main characters are star-crossed lovers who have to work to finally be together. 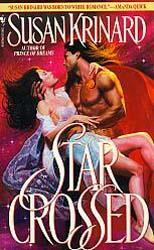 Bantam published Star Crossed by Susan Krinard in 1995. Star Crossed is side Loaded on my Nook but I don't remember where I purchased it. This is a very good first Regency Romance. There are a few flaws in the book but the story is so engaging they are easy to overlook. 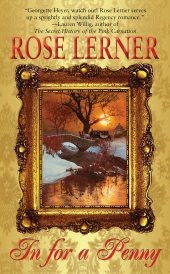 Rose Lerner has managed to bring a new twist to the rich manufacturing heiress marrying the destitute aristocrat. Lord Levinstoke needs a rich wife and Penelope (Penny) Brown fits the bill. She wants a marriage based on companionship and mutual esteem, he promises to give her that in exchange for her money. Both know what the other expects. As soon as they marry all of their troubles should be over. Of course when they arrive at Nev’s family home instead of all the troubles being over they just seem to multiply. I think that Rose Lerner is an author to watch. For a refreshing Regency Romance be sure to pick up In For a Penny and watch for her next book Lily Among Thorns in January of 2011.
Leisure Books published In For a Penny by Rose Lerner in 2010. I purchased In For a Penny from Borders. Why my To Be Read pile continues to grow. I have been making a concentrated effort to read through my TBR pile. What I am finding is that reading books in the TBR pile just makes it grow larger. This is how that happens. I read Bloody Good (see my April 2nd post) and loved the book. That meant that I had to read Bloody Awful and Bloody Right. I purchased both and they are loaded on my Nook waiting to be read. So I took one book out of my TBR pile and added two more. The same thing happened when I read Silent in the Sanctuary by Deanna Raybourn. That book was added to my TBR pile after I read Silent in the Grave (see my post on September 1, 2009). After reading Silent in the Sanctuary I have to read Silent on the Moor. At least here it is a one on one trade. After reading And Only to Deceive by Tasha Alexander (see my post on July 22, 2009) I added A Poisoned Season. After reading A Poisoned Season I want to read the rest of the series. That will add multiple books. To make things even worse I just read What Angles Fear by C.S. Harris the first book in the series. I loved the mystery and now have added the rest of that series. I can’t win for reading. Oh well! There are worse thing in life than having too many books to read. Bloody Good is a new take on vampires. Like dragons, pixies and shape changers vampires are one of the Others who still live among normal humans. The time is World War II, the place is a small village outside of London, and the characters are a mix of Others and normal humans. The German’s have dropped vampires in the area with the goal of helping the German invasion of England. Things don’t go as planned thanks to the mix of Othersand humans already living in the area. They do whatever it takes to protect home and country. With a great cast of characters and good world building Bloody Good is a enjoyable story. 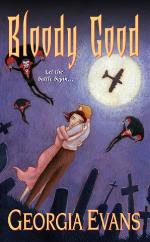 Georgia Evans takes the time to develop both the characters and the differences between our world and the alternate history world in Bloody Good. The pacing is not rushed allowing the reader to savor the story. The details also set the scene for the next books in the series. Currently there are two additional books;,Bloody Awful and Bloody Right. Kensington Fantasy published Bloody Good by Georgia Evans in 2009.